(37x41) Mens 1970s Levis Big E Jeans! 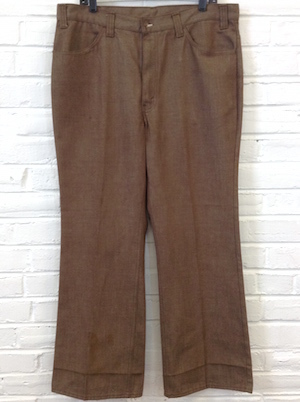 Chocolate Brown Denim! Home > Men's Vintage Shirts > Men's Vintage Shirts: 1970s > (37x41) Mens 1970s Levis Big E Jeans! 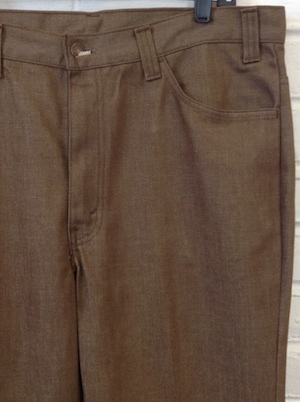 Chocolate Brown Denim! Vintage 1970s amazing men's flare leg disco pants! 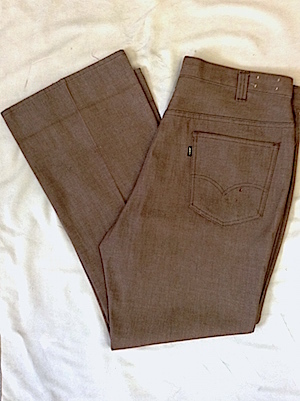 Made by Levis, these funky jeans come in a great shade of chocolate brown denim! Has a copper Levis button closure and a brass talon zipper. On the back pocket is a black tab with gold lettering that reads LEVIS (capital E). Whats cool about this, is that Levis only used the "Big E" up until 1972, so this helps to date your pants to the late 60s-early 70s. Classic jean style with two front pockets and two patch pockets in the back. Extra long and wide belt loops. Nicely flared bell bottoms. Tagged by Levis. No material tag, but most likely 100% cotton or a cotton blend.